I really need to edit and post another episode of my new podcast. I’ve got a few interviews to publish, and they’re all awesome. Soon! I was recently asked by someone about the mechanics of how I do my podcast and thought it would be worthwhile to share with you. 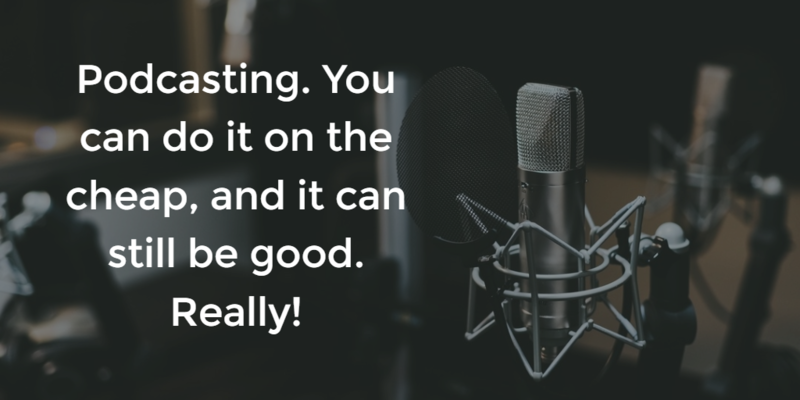 Hopefully, if you’re thinking of starting a podcast, you’ll find it useful. I’m trying to do it on the cheap, to show nonprofits that you don’t really need to invest much to make it work. I’m using my Android smartphone for in-person and phone interviews. For phone interviews, I have an app that records phone calls. I use Boldbeast (FREE, but has a premium version you can upgrade to), but you really have to see which app is compatible with which phone – they don’t work with them all. For example, I used a different recording app with an older phone, but it wasn’t compatible with my new phone. I’m using the free version, but will probably upgrade to their paid version, mostly to value the app and help them keep it updated! For in-person, I have used simply the phone itself and a recording app. Your phone comes with a built in app, I use Tape-a-Talk Pro. It’s an upgrade from the free version, which I recommend you try first and then decide if it’s for you. Good quality audio. When I’m recording myself, I’ve used my ear bud mic, and it’s worked well. Now I use a lapel mic. The set up isn’t perfect for my Android phone, as the dual input/output splitter is optimized for iPhones/iPads, but it worked really nicely. If you listened to my interview with Dave Montague, that’s what I was using. His audio sounds particularly good, which is the most important for an interview-style podcast anyway. I decided to buy an external mic for my computer to use to create better audio on my end when I’m doing Skype interviews (my in-computer mic is pretty weak), so I bought the Blue Microphones SnowBall iCE USB Microphone (OK, I just clicked on that link and cried a little to see the holiday discount they currently have…). It’s not the highest end mic, but totally does the trick for me. I’m really happy with the audio quality. To record Skype interviews, I’ve tried a few different programs. I used the free version of Pamela, which worked not badly, but not always consistently. Same with MP3 Skype Recorder. Man, that one nearly ended me. It initially worked really nicely with a Skype call that I’ll be posting next month sometime, but then stopped recording longer calls. I’m currently using iFree Skype Recorder and it’s been stable. Fingers crossed. But really useful learning here. All the apps I mention above have settings that you need to play with to make sure they work for you. For example, Skype recording programs allow you to record in stereo or mono. Mono is your friend here, in my experience. When I tested in stereo, essentially one of you is heard in one ear, and the other person in the other. That doesn’t really work for podcasts, in my opinion. I don’t know about you, but I listen on my phone at times with just one ear bud. If the recording is in stereo, I’ll miss one voice! Also, I’ve found that mono has produced cleaner audio for me. I’m sure an audiophile would tsk-tsk me on that, but it’s been my experience. Now, if you’re going to mess with app settings on your phone, test the result first! I almost lost an awesome interview because I changed the volume settings in Boldbeast, resulting in heavily distorted audio from my interviewee. Ayee! Could I have re-recorded it? Maybe. But, I didn’t want to bother my interviewee, who had already given me their time and insight, and I think it wouldn’t have been as spontaneous the second time around. Well, that’s when I discovered more about Audacity’s (see below) more powerful editing features, and also the audio editing magic people on Fivrr could provide! If you need audio editing, allow me to recommend Spartak! I’m sure I will eventually come up with a simpler way (recording both with Audacity will probably work), but that’s working for now. play with settings to make sure they work for you, before you record an interview! I pull it all together using Audacity (FREE and awesome) to edit the audio on my PC and have been learning quite a bit about what’s possible with audio editing! Overall, it’s pretty easy to use. Their help files and YouTube video tutorials from others I’ve found are also useful. Speaking of others, for podcasting there’s an incredible and vast group of people out there creating useful info and resources for you. One of the things I’ve done is read up on a lot of how-to podcasts, which tend to give great advice about hardware and software, as well as general how-to’s. There are also great reviews on YouTube for all the products I mentioned, including how to create a cheap lapel mic from your smartphone headphones. Really neat and innovative ideas, and tonnes of great sharing out there! That ought to keep you busy. Happy podcasting!! This entry was posted in Online Service and tagged digital literacy. Bookmark the permalink.